The kingdom of Tonga is a wonderful destination for cruisers; friendly people, settled weather and clear waters attract charter fleets as well. We reached this collection of volcanic islands after a 3-day sail from American Samoa and anchored at sundown thanks to a light from a friendly cruiser. Neiafu is the check-in port and the Customs official is the first in our travels to try to extract 'presents' from us. 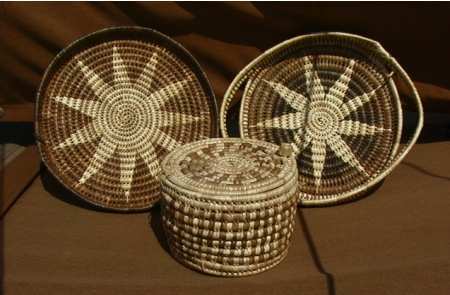 'Basket fever' came over us as we bought a supply of beautiful woven baskets from Kalo Mesui, a young Tongan woman. She later invited us to her home and we shared a wonderful Sunday dinner with her and her family after church. The service, at the Church of Tonga, was all fire and brimstone, spoken in Tongan with only a few glances at us, the only Western faces in the flock. This group of islands has some of the most sheltered waters we have seen - and thus a large charter fleet. Anchorages are known by their number from the Moorings charts (Lisa Beach, an all-time favorite is #10). Low atolls a day's sail south of Vava'u, we did not stop there but cruisers found the snorkeling to be superb and people as friendly as elsewhere in Tonga. Nuku'alofa the administrative center and capital, is located on Tongatapu at the south end of the kingdom. Most cruisers anchor nearby for access to the city and the provisioning it permits. The Royal Palace is near the center of Nuku'alofa.